Among some materials that I bought from Vienna's Dorotheum Auction House http://www.dorotheum.com/en.html in April, I found a few pictures taken at the May Day Parade held in Vienna in 1955. 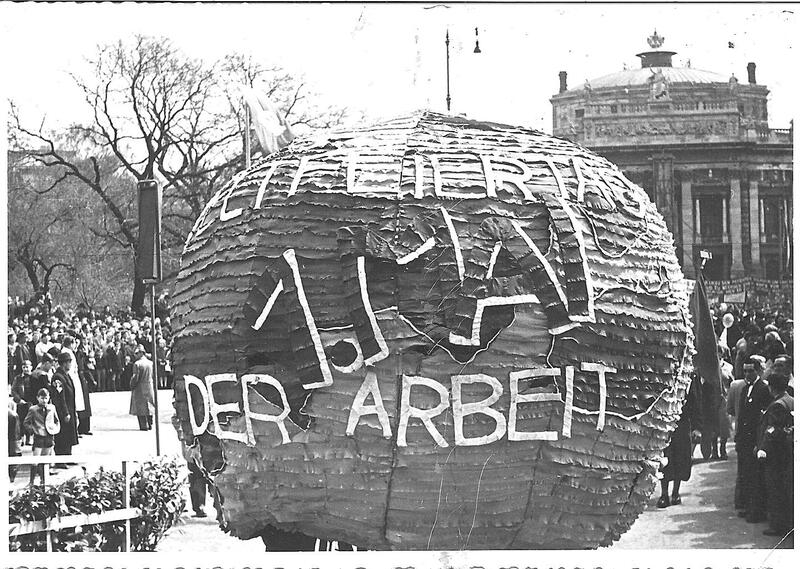 This date was, of course, a holiday, International Worker's Day. And on this day, it was traditional during much of the 20th Century for the workers in Vienna to hold a parade on the Ringstrasse. The May 1, 1955 date was especially significant in Austrian history because it was the tenth anniversary of the reinstatement of the 1929 Austrian Constitution, the one that had been discarded by Chancellor Dollfuss on May 1, 1934, following the civil war that destroyed the Social Democratic Party and created a one-party Austro-fascist state. 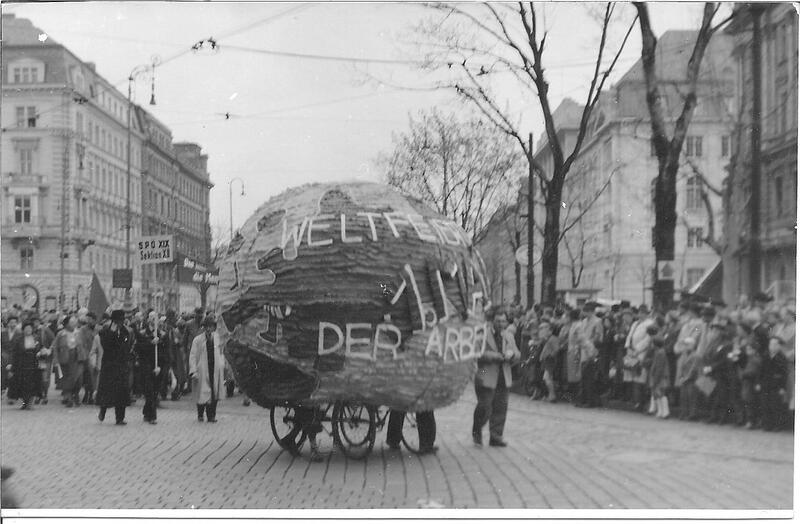 Also, May 1, 1955 had to be a time of optimism for Vienna and Austria because it was just two weeks before the signing of the Austrian State Treaty whereby the U.S., Great Britain, France, and the Soviet Union returned sovereignty to the Austrian state and ended their occupation of the country. Most of the pictures of the parade was taken at around 10:15 in the morning at or near Schottentor (see the clock in the picture below). 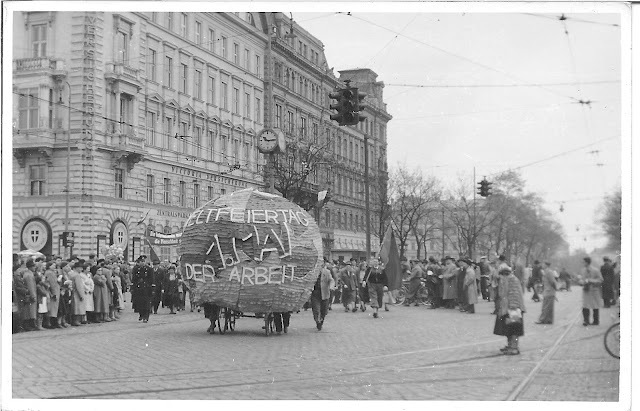 The first shows a float that is a globe with the words "World Holiday of Labor, 1 May." The float is built on a platform of two bicycles, and you can see the legs of the two people inside the globe moving it forward. At the rear right of the float is a man holding a flag, but I cannot tell what it represents. To the rear left is a banner whose words are mostly blocked by the float. It appears that a pretty good crowd is observing the parade. 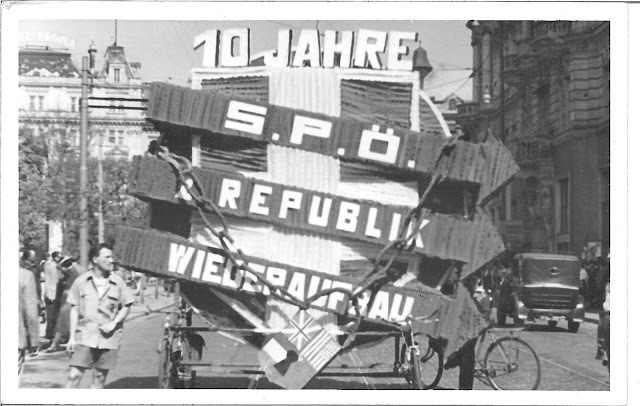 A little later view of this float, up the Ring a few steps from Schottentor, shows good crowds and an identifying sign, "SPOe XIX, Section XII." I think this sign identifies the marchers following it as members of the Socialist Party of Austria who live in Vienna's19th District. The parade also had bands, including the one shown below. The building behind the band still stands today with Victoria Versicherung written on its exterior, but the Tuxedo Club is long gone. Note one of the bicycles to the right has decorated spokes. My small cache of pictures include one other float, this one a little stranger than the first. It seems to be a celebratory float with a bit of protest. It shows the three arrow symbol of the Socialist Party of Austria and says "10 Years, Socialist Party of Austria, 2nd Republic Reconstruction. It has a chain around the float with a lock showing the flags of the U.S., Great Britain, and France (but not the Soviet Union). This float seems to suggest that these three occupying powers had hindered the rebuilding of the Second Republic. 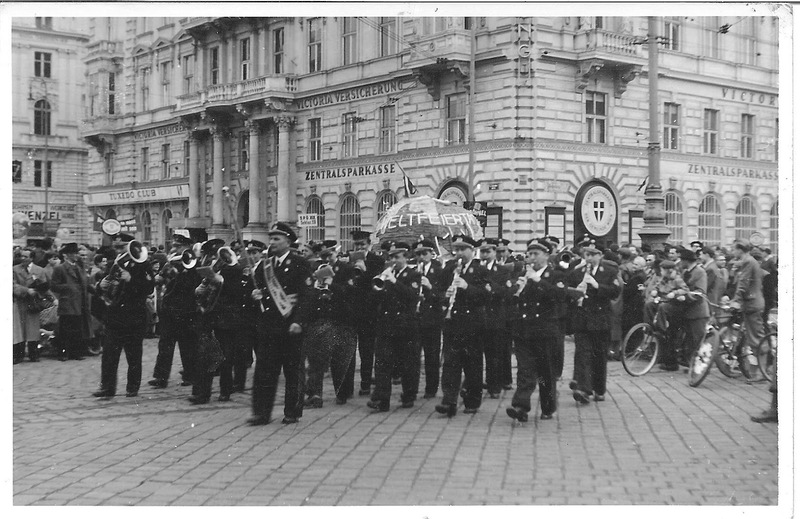 The parade ended in front of the Vienna City Hall. The following is the only picture taken at that location. You can see the first float, plus some large crowds, and the Burgtheater in the background. No doubt speeches followed the parade. A Month in Vienna: Plan it Now!